Neil McCafferty congratulates Adam Mullan on his goal. Oran Kearney was pleased with his side’s efforts on Saturday. “Normally we wouldn’t pick to play a side like Ballyclare this early in pre-season as you’d like to get a wee bit of work done first,” he said. “They are a good side, they have lots of guys about them who I know from Championship level. “You could see by the end of it the result hurt them. “I said to the players before the game we’ve put so much work in over this last two or three years in relation to recruiting the best young players around here. “It’s very rare we come in to a season with only one new player signed so far, a lot of people would possibly see that as a criticism. “But I see that as a strength as we’re not a club in transition, we’re a club that’s building. 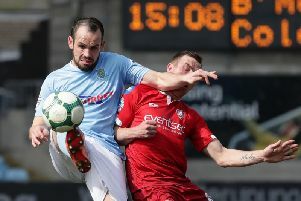 “We finished fifth last season, yeah it was disappointing how it all panned out in the end, but we want to be in the mix again this season,” added the Bannsiders boss.